Horse chestnut trees — lovely, aren’t they. 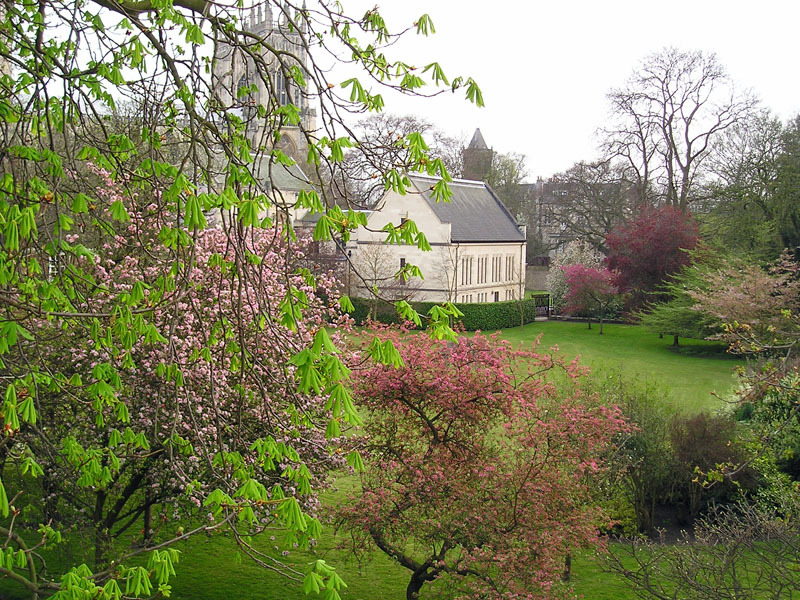 A sight to gladden the heart in spring when the sticky buds open and the large green leaves unfurl, crinkled like pencil sharpenings, opening up like big generous hands, and then the candles of blossom in May, massive and majestic. Hold that thought, and perhaps feel a bit sad that this sight is increasingly rare in our city streets and parks as more chestnut trees are removed. At the edge of Bootham Park hospital grounds is a group of mature trees, which until recently included a huge horse chestnut. I wish I’d taken photos of it when it was tall and splendid. Instead I can only offer you this image, of its massive trunk cut into sections, in early February. I pass by most days, but on one of the days I didn’t a friend alerted me to the removal of some of the tree’s branches, closest to the pavement. We both hoped that was as far as the work was going. I tried to find the relevant record on the council’s online ‘public access’ system, because when trees are in conservation areas, as this one is, permission is needed to do work on them. This involves displaying public notices and giving members of the public chance to comment. I wondered if I’d missed the notice period, and that bothered me, as I try to check applications fairly regularly. I couldn’t find any record of this work so I emailed to check. Esther Priestley sent me the relevant documents, showing that the usual rules don’t apply in this case. If a tree is considered dangerous because of disease then the usual procedure is bypassed. So this tree was felled very quickly, and no other opinions came into it. There was no public notice and no opportunity to comment. I realise I’m not a tree expert. 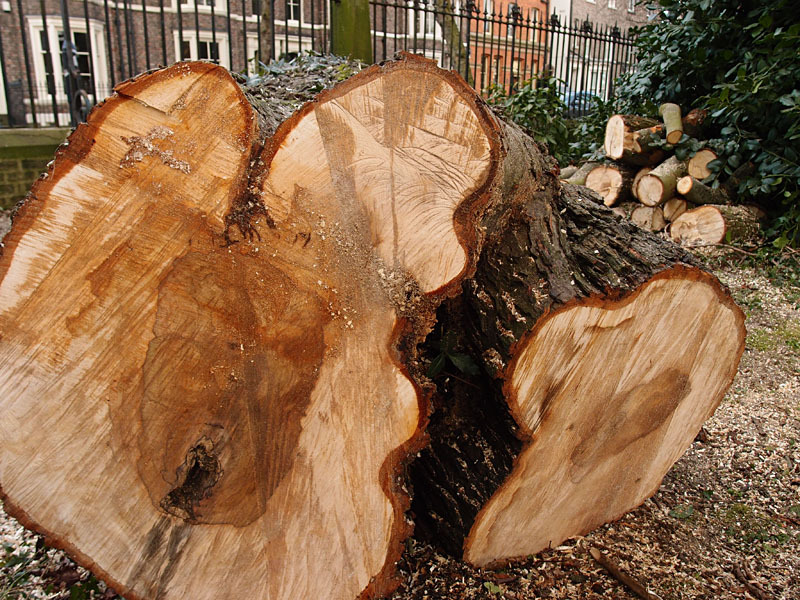 But I would like to raise a few questions, because so many mature and beautiful trees are being felled on the basis of perceived risk, and it troubles me. 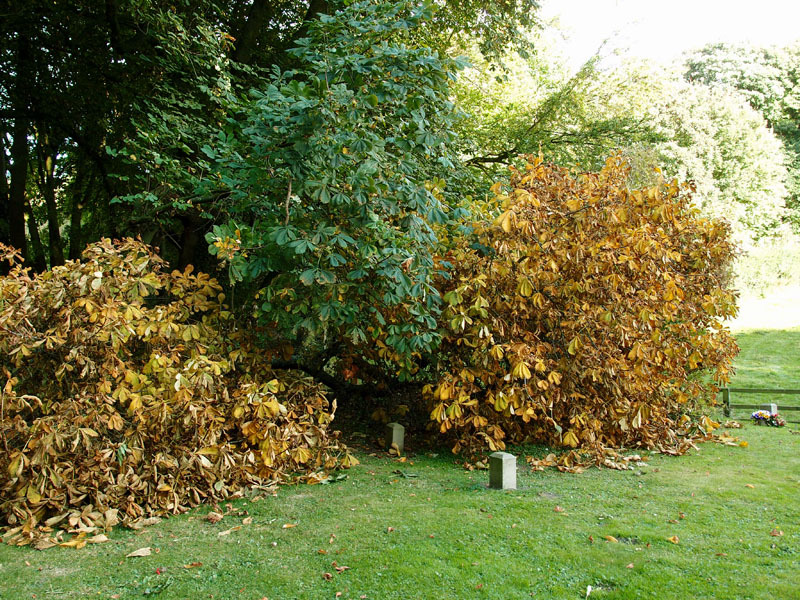 Horse chestnut trees seem to be particularly at risk. I’ve noticed many mature specimens have been removed from the local landscape in the last year or two. Here are a few more examples. This is the bar walls walk from Bootham Bar to Monk Bar, and this is how it used to look as you walked along it towards Monk Bar from the corner tower. Isn’t it fabulous. Like being up in the trees, with those chestnut tree leaves all perfect green to the right. This photo was taken on 31 May 2013. I have many more photos of these trees taken in various years. I used to make a point of visiting them in the spring. They’re not there now, they were removed in early spring last year, as previously discussed. It’s still a pleasant walk and the gardens still look lovely, but something quite magical has gone, and will probably never be replaced, because we don’t plant those kinds of trees anymore in cities, close to buildings. The usual response, generally thought sufficient, is to plant another tree. But we’re planting rowan trees, birches, trees that will never achieve the same effect as these massive mature horse chestnuts, or the beeches, oaks and limes. A little further along, in the gardens of Gray’s Court, there used to be a very handsome chestnut. It’s now a stump, with a carving. The Press reported on this with what I think was probably the most ludicrous headline I’ve ever seen (since reworded, I noticed, though the link to the page shows the original wording). We were informed ‘Sculptor rescues dying tree’. Does this look ‘rescued’ to you? It looks like a stranded ugly stump to me, from the bar walls side. The article describes the carving of the remains of the trunk. A small part of it is visible here. Yes, it’s a splendid carving, but really, the tree was much nicer when it was actually growing, rather than stumpy. The trees around it have been lopped too, and aren’t looking so great. 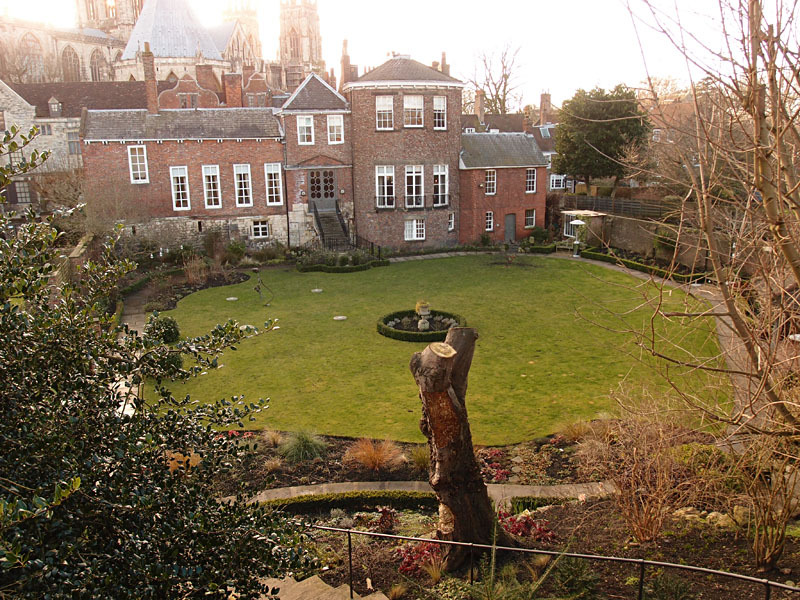 Still, there’s a better view of Gray’s Court from the walls now there are fewer trees in the way. 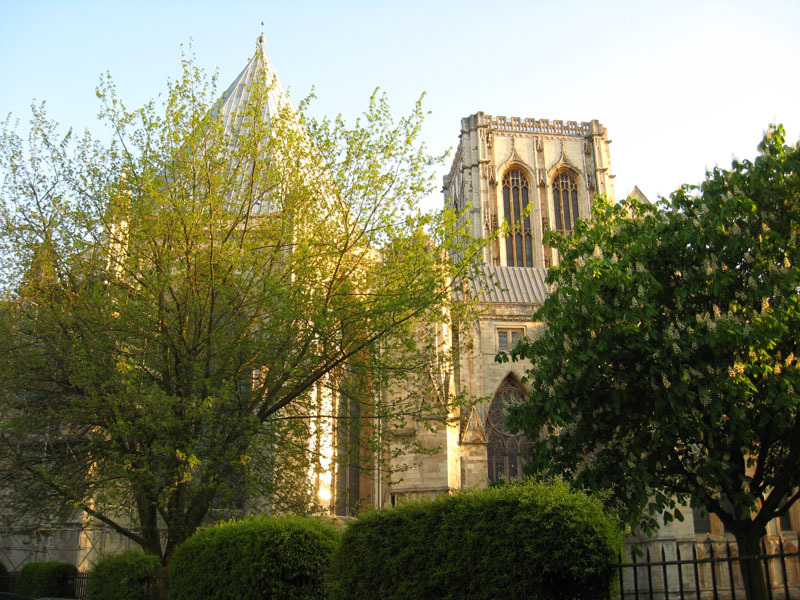 And a clearer view of the Minster since the other horse chestnuts were cut down. And perhaps I’m the only person who cares anyway. I think this horse chestnut on the right of this photo of Dean’s Park has gone too, available documents suggest. A younger tree, in this case, just getting its roots down properly. I’m not sure what the reasons were, as is so often the case the relevant background documents aren’t available on the public access pages, have been removed. So although I’d like to be enlightened and wise on the reasons for the removal of this tree, and share this information with you, I’m not and I can’t. 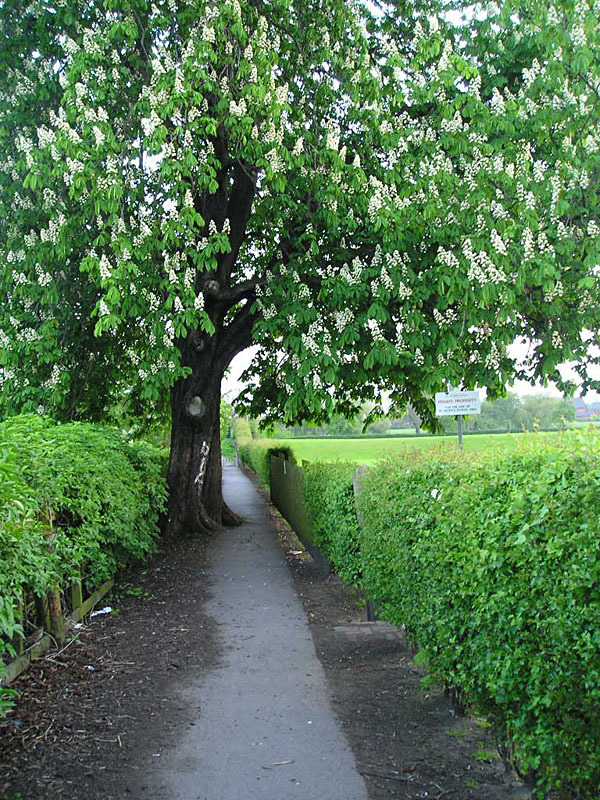 Outside the city centre, in Clifton, on a snicket leading to the riverside, another horse chestnut that impressed me so much I took a photo of it, on 10 May 2004. This tree really did gladden the heart. Even though it kind of interfered with the footpath, got in the way a bit, and its roots made the path rather bumpy, wasn’t it a splendid thing. I walked down there recently and it’s gone. There’s just a bit of board over the place where its old gnarly solid trunk used to be. I don’t know why this one was removed, whether it had any protection, whether there are any documents available about its removal. I couldn’t find anything. Tree observers will have noticed that trees, like people, are susceptible to diseases. 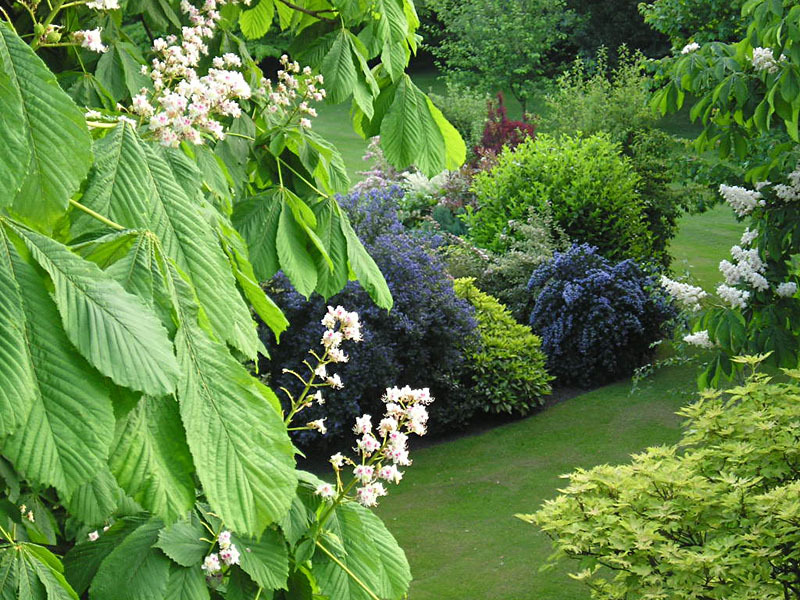 Horse chestnut trees in recent years have had unsightly markings develop on their leaves. They also suffer from canker, and have a tendency to drop branches. 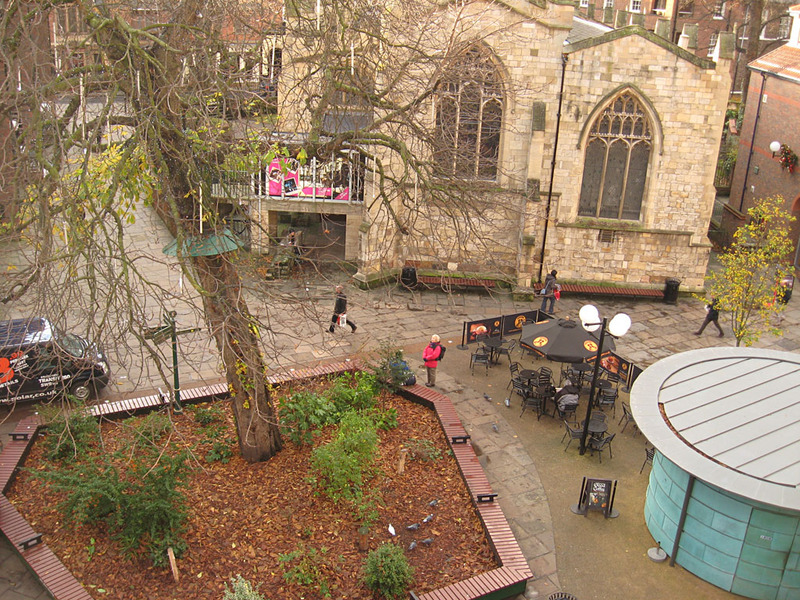 The branch drop problem is the reason that the horse chestnut tree in the Coppergate Centre was removed. Here it is, pictured in November 2012, from the multi-storey car park area. 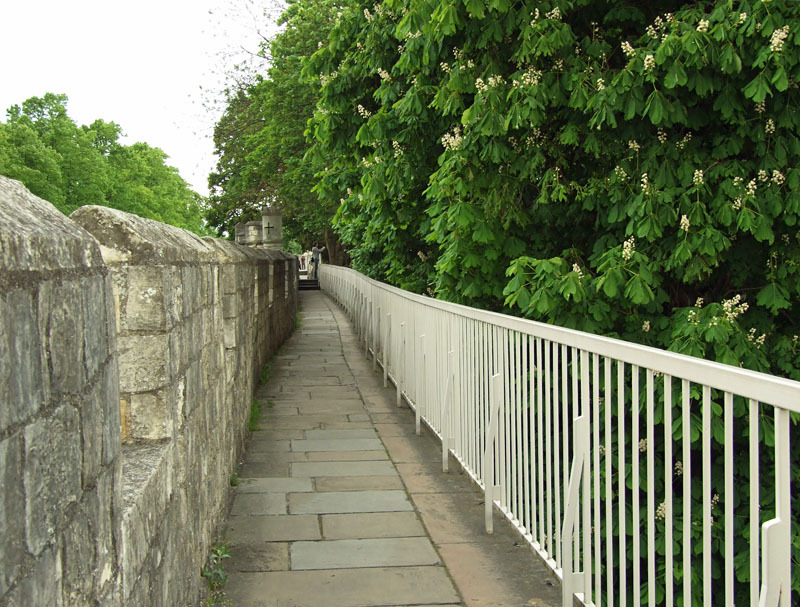 A falling branch from this one almost resulted in death or injury to members of the public, as reported in The Press. Because of its central location in a busy square, the removal of this one was probably inevitable and justifiable. And I don’t wish to cast aspersions on tree surgeons, but I’ve often wondered about the phrase ‘tree surgeon’ and the way it brings with it certain associations, of a person who goes around curing trees, mending them, cutting out disease to leave healthy tissue, as a surgeon in a hospital might remove cancers from our human bodies. But tree surgeons also cut trees down, and increasingly so, it seems. The Irton tree campaign made me more aware of the many threats to trees in our towns and cities. There seems to be an increasing emphasis on dangers and damage, and an increasing fear of litigation because of these ‘dangerous’ trees. Playing sport can be dangerous, and result in injury. Driving a car or riding a bike can result in injury. Going up ladders to do DIY in our houses quite often results in injury. We seem to accept a certain amount of risk in all other areas of life but it seems that as soon as trees show signs of a disease that might possibly mean a risk of a branch falling — and it must be a tiny, tiny risk compared to the risk of say having a car accident — we remove them. It’s perhaps easier to be a tree if you’re growing in a more rural location. Far away from York, by the church of Great Givendale in East Yorkshire, another horse chestnut. Pictured in October 2013. 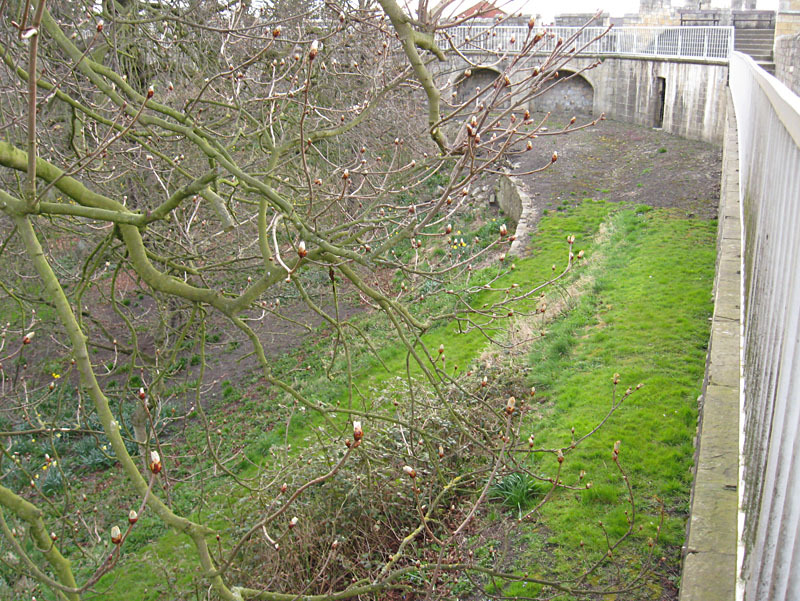 I took this photo as it appears to be a good example of the tendency horse chestnuts have to drop their lower branches. 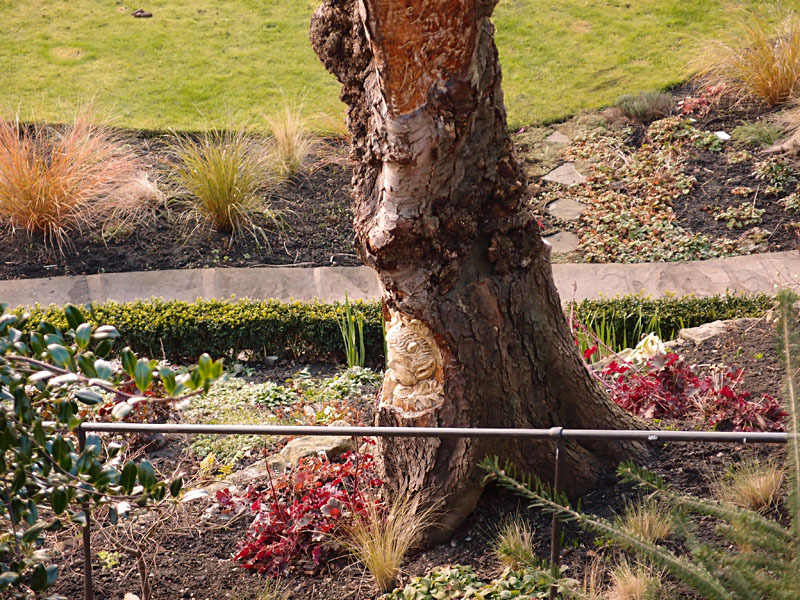 (I hadn’t known about this issue until the Coppergate Centre tree brought it to our attention.) This one had lost a couple, hence the yellowing leaves on the broken branches lying on the ground still underneath it. But out here there was nothing to harm, only graves under its canopy. This one too may have been removed since, but in general it’s clear that trees are safer out in the more rural locations. It’s looking as if we might all have to travel out of the city to these more rural locations if we want to see mature horse chestnut trees. So let’s not take them for granted. Remember to properly appreciate the ones we still have. And perhaps check every now and then on https://planningaccess.york.gov.uk/online-applications/ for recently submitted applications to fell trees. They’re not all protected, but sometimes we get an opportunity to object. And sometimes people do. But apparently we only really care about trees planted by royalty. 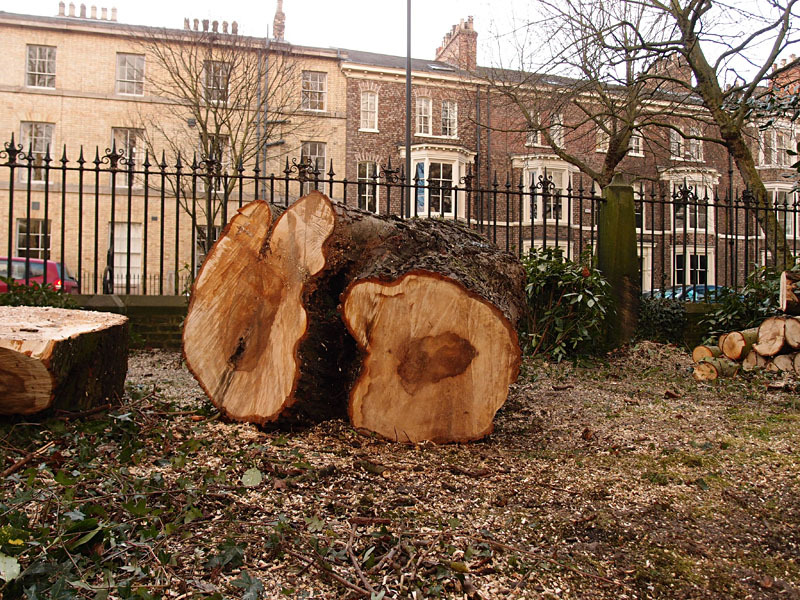 I’ll end this page with a few more photos of those particularly beautiful specimens in the Minster precincts, felled last year. 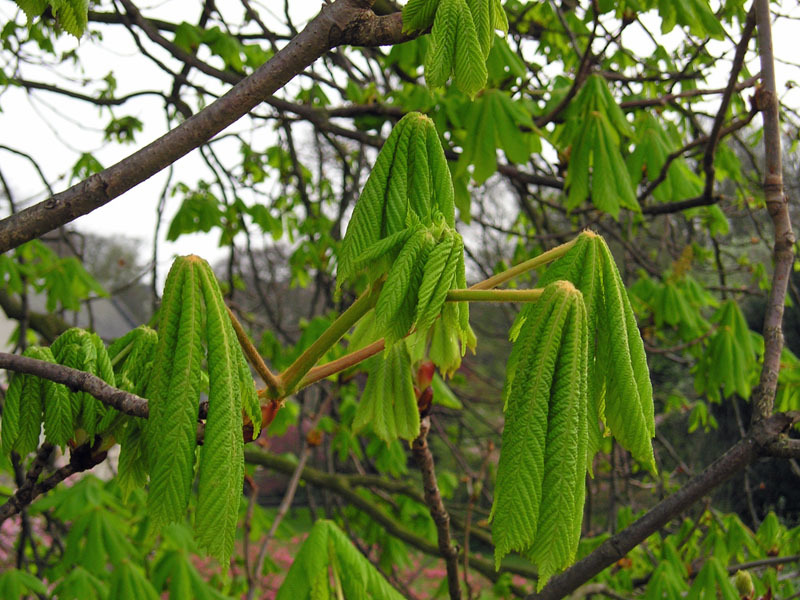 If you see this sight this spring, elsewhere, of chestnut tree buds unfurling and their branches blossoming, make the most of it.